Centerline porosity occurs when acetal cools during its manufacturing. The outer portions solidify first and as the material cools there is a corresponding loss of volume in the center. Problem is the inflexible extruded “shell” restricts the volume change, causing pockets or voids to form. This phenomenon is visibly noticeable in acetal sheet or rod as a light band in the center of the material. The acetal may appear to be laminated to the naked eye. This has several undesirable effects but the two most important in applications are: 1.) Porosity provides a route for gasses and liquids and 2.) Porous regions permit bacterial growth in food processing or medical applications. The issue is with the homopolymer resin, however. 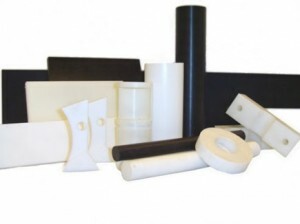 Copolymer acetal has lower centerline porosity and thus in applications where bacteria is an issue, or jobs where outgassing is a problem, copolymer would be advantageous – even though the strength is (slightly) less than homopolymer material. Centerline porosity may or may not affect your application – but it is certainly important to keep it in mind.